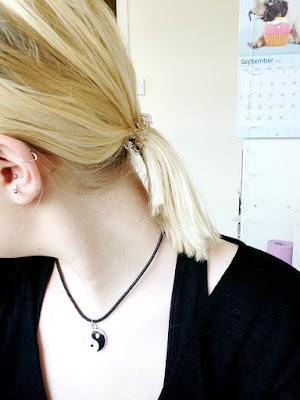 When it comes to hair I'm a fussy one, I hate putting my hair up in a bun or a ponytail (except now I have had mine all chopped off into lob so looks a bit silly haha) then taking it out and my hair has a massive kink in it and looks like I've just woken up! 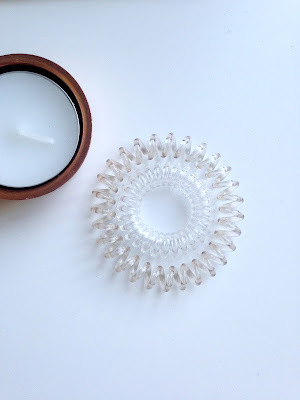 But over the summer a few of my friends kept talking about the Invisibobble, a traceless hair ring that is shaped like a spiral meaning the hair can't get trapped and therefore you can't get a kink! 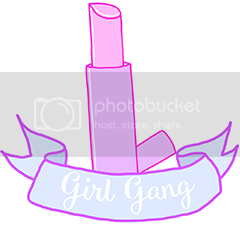 I didn't really understand the whole concept and thought that it doesn't matter what kind of hair tie you have, surely it will kink your hair! Oh how wrong I was! I was searching for some make up one night on Topshop.com and I clicked on the hair section as I was hoping to buy a scrunchie (90's gal at heart) and when I saw that Topshop sold the Invisibobble I thought I might as well try it and see what the fuss was about, although I wasn't happy with the price £4 for one hair ring, what a rip off! 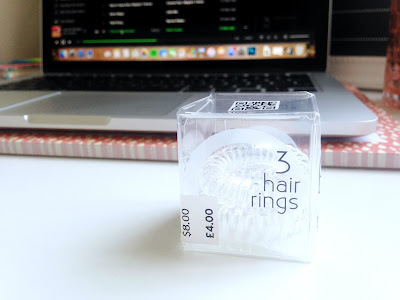 But when I received my Topshop package (also why the hell is Topshop delivery £4 that is daylight robbery if you ask me) I realised that you don't just get one hair ring you get 3, which made feel a bit better about the price haha! 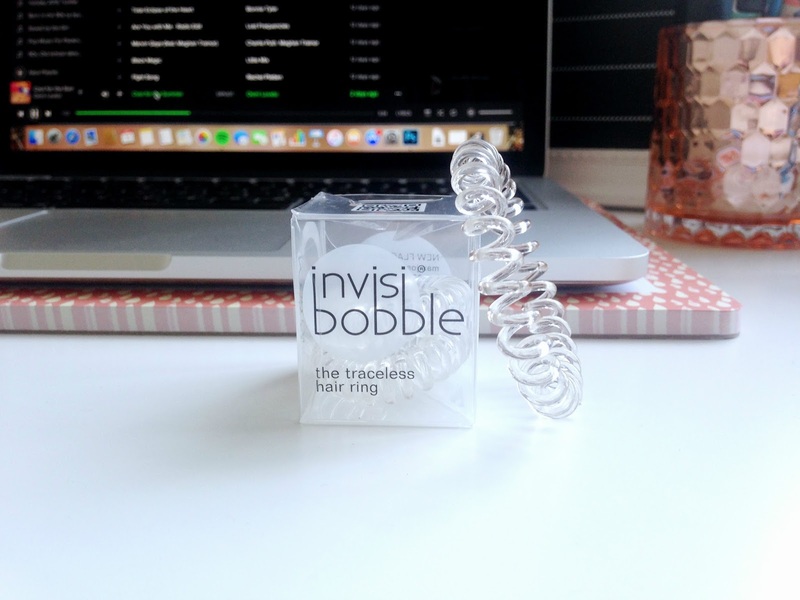 The packaging was compact and simple in a tiny cube box, the first thing I noticed about the Invisibobble was how small it was, and I wasn't convinced that this tiny thing could stretch that far but surprisingly you can wrap it around even the thickest of hair! So I thought I would give it a try, I put my hair up in the morning and left it there until I was about to go to bed. I was seriously so surprised with the results, my hair fell back down, no kink, no bedhead hair although it did have a bit of a waviness to it. I was pleasantly surprised at how well it worked! My biggest gripe I with this product however is that, if you stretch the bobble too much it becomes all loose and doesn't go back to being all small and compact, it just stays loose and you have to mould it back into it's smaller shape which is pretty annoying, I was sort of expecting it to spring back to the size it was in the box, but never mind! Overall I am so impressed with these hair ties. They are a bit pricey for what the are to be honest but I know that you can get cheaper ones in Primark, so if you think paying the £4 is a bit too much head there and check them out! This is definitely a step forward in hair tie technology haha! 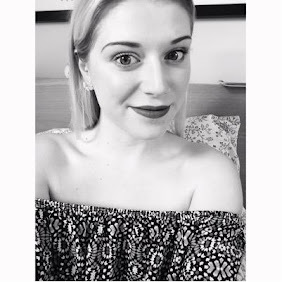 I don't think I will ever use anything else on my hair now, I just love how you can take your hair down after wearing it up all day and you can't even tell that it has been up in a bun or ponytail, it is virtually undetectable! Have you tried the Invisibobble? How did you find it? I have seen these around a bit recently and am so intrigued by them! They look so strange but if they leave hair kink free then I am all for it!